Buzzers Are Our Only Business! 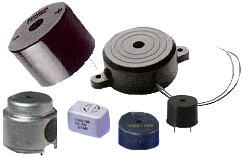 Monaco Components has reliably delivered quality buzzers, transducers and speakers to the marketplace for over 25 years. We offer one of the largest and most diverse varieties of audible signaling components available today. Our buzzer product line includes various configurations for PC board, panel mount, flange mount and surface mount applications. They are available in piezo buzzer or electro-magnetic buzzer types with a variety of input voltages and sound level values. Our staff is ready to help you analyze your requirements and offer you the most suitable model to satisfy your buzzer requirements. Monaco Components also offers you cross-referencing capabilities, just give us your current product specification and we will provide our closest equivalent. Modifications and customizations are available. Please feel free to call 516-767-6644 and speak with one of our Sales Engineers or complete the Application Worksheet for a rapid reply.